UPDATE: I was notified that some were having issues with downloading this particular freebie at youpublish and something does not seem to be quite 'right' with it. However, I can't really decipher the problem and I don't want any of you to miss this freebie if you like it, so I have created another download link at box.net. Please go here to download through box.net. Sorry for any inconvenience. 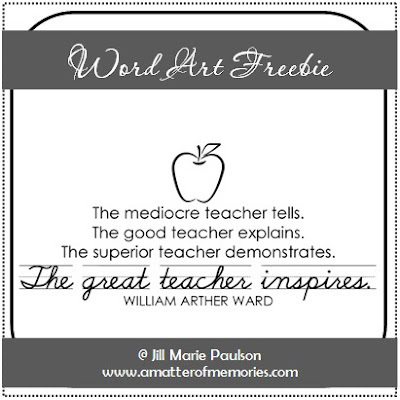 I know that my daughter is quite lucky to have a teacher that falls into the final catagory of Ward's winning quote and we certainly count our blessings for that every day. I hope you can find a use for this word are freebie. I believe that I am going to print it off on some nice paper and let Kaitlin use it to make a card for her teacher yet this week. Be sure to check out my other word art downloads to make sure you haven't missed any.